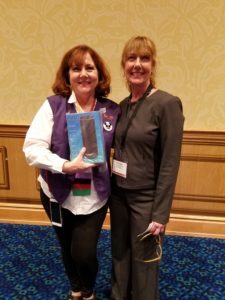 ACNL Conference February 6th – Booth Raffle Winner! Livonne Engebrecht (right), Search Associate, Kirby Bates Associates congratulates the ACNL raffle winner, Jami de Santiago, RN, BSN, PHN, MS, Senior Practice Management Consultant, MedAmerica/CEP America. KBA thanks her for stopping by booth #614 and hopes she enjoys her new Amazon Echo!